(Nasser Nasser/ Associated Press ) - A supporter of Egyptian President Mohammed Morsi holds a banner with his picture and Arabic that reads, “yes for the constitutional declaration to stop corruption,” during a protest in front of Egypt’s top court, in Cairo, Egypt, Monday, Dec. 3, 2012. The Egyptian president’s top legal adviser says the country’s election commission has begun preparations for the referendum on Dec. 15 on a highly contentious draft constitution. CAIRO — Egypt’s political crisis is widening, with plans for a huge march and a general strike Tuesday to protest the hurried drafting of a new constitution and decrees by President Mohammed Morsi that gave him nearly unrestricted powers. Morsi also faces the prospect of wider civil disobedience as media, the tourism industry and law professors pondered moves that would build on a strike by the nation’s judges.The planned strikes and march raise new fears of unrest, threatening to derail the country’s transition to democratic rule. “Egypt is a big ship in high seas, and no one should stop its captain from taking it to the shore,” said Morsi’s legal adviser, Mohammed Gaballah, defending his boss. “The ship must keep moving under any conditions,” he told The Associated Press on Monday. The country’s judges have already gone on strike over Morsi’s Nov. 22 decrees that placed him above oversight of any kind, including the courts. Following those decrees, a panel dominated by the president’s Islamist supporters rushed through a draft constitution without the participation of representatives of liberals and Christians. Only four women, all Islamists, attended the marathon, all-night session. 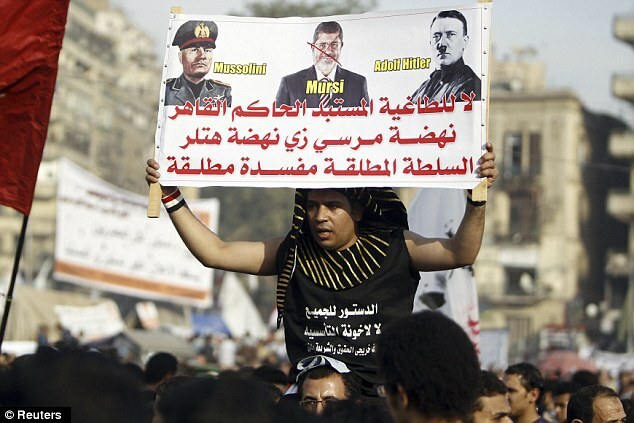 Morsi has called for a Dec. 15 national referendum to approve the constitution. An opposition coalition dominated by the liberal and leftist groups that led last year’s uprising had already called for a general strike Tuesday and a large demonstration against the constitutional process and Morsi’s decrees. Newspapers plan to suspend publication, and privately owned TV networks will blacken their screens all day. Monday’s front pages of Egypt’s most prominent newspapers said, “No to dictatorship” on a black background, with a picture of a man wrapped in newspaper and with his feet shackled while he squatted in a prison cell. Hotels and restaurants are considering turning off their lights for a half-hour to protest against Morsi, according to the Supporting Tourism Coalition, an independent body representing industry employees. Cairo University law professors petitioned their dean to let them stop teaching. “The professors believe they must not teach law under a regime that doesn’t respect the law,” said one of the professors, Khaled Abu Bakr. The staff of the Internet edition of the al-Ahram daily marched Monday to the journalists’ union in central Cairo to protest what they said was the absence from the draft constitution of guarantees against jailing reporters in defamation cases. Protests over the draft constitution also spread to state television. She told the independent al-Masri al-Youm daily newspaper that she planned to sue the station. Morsi’s moves have plunged an already polarized Egypt in the worst political crisis since the uprising that ousted authoritarian President Hosni Mubarak.